Talk about a sleeper announcement... seems that THQ Nordic is more than just a remastering factory after all. 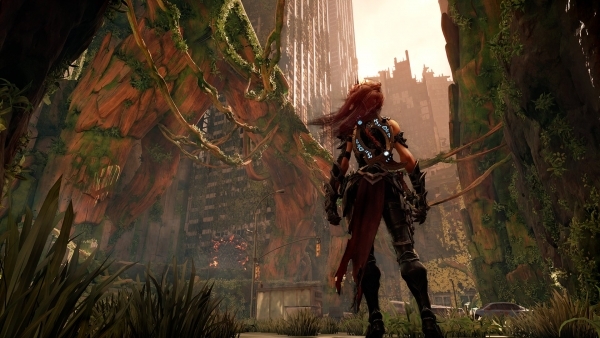 "Return to an apocalyptic Earth in Darksiders III, a hack-n-slash Action Adventure where players assume the role of FURY in her quest to hunt down and dispose of the Seven Deadly Sins. The most unpredictable and enigmatic of the Four Horsemen, FURY must succeed where many have failed - to bring balance to the forces that now ravage Earth. Darksiders III is the long-anticipated, third chapter in the critically-acclaimed Darksiders franchise. Darksiders signature art style - expansive post-apocalyptic environments that take the player from the heights of heaven to the depths of hell, dilapidated by war and decay and overrun by nature"
It has my interest. I never finished 2, but enjoyed what I played of it. This could be a good excuse to go back at some point. Both Darksiders and Darksiders 2 are available for dirt cheap on the PS4. I recommend that you play them both before delving into this one. Looking good. Darksiders 1 and 2 are in my backlog and I plan to play them before this comes out. I was thinking about this yesterday and watched some newer gameplay segments from about a month ago. I'm still gutted over the last half (getting ahead of myself) having different a different team, different art direction, but it looks like they are trying to honor Joe Mad's style. Characters like Vulgrim and The Council still seem to retain their original designs. Fury's hair bothers me, tho. She definitely wasn't working with Merida or Rapunzel's cg artists. I'm so happy to see it's near tangible, since the fate of it was questionable for some years. Also, figures a haughty collector's edition would come out on the cusp of KHIII and the series's explosion of merch.